Chief-of-Staff of the Iranian Armed Forces Major General Mohammad Hossein Baqeri and Azeri Defense Minister Lieutenant General Zakir Hasanov signed a Memorandum of Understanding (MoU) to bolster defense cooperation between the two countries. The MoU was inked in the Azeri capital, Baku, following a meeting between General Baqeri and General Hasanov, Fars News Agency (FNA) reported. Baqeri told reporters after signing the agreement that both sides explored ways to bolster bilateral defense ties during the meeting. The Azeri minister expressed confidence that the visit would further enhance “mutual military cooperation to the highest level”. 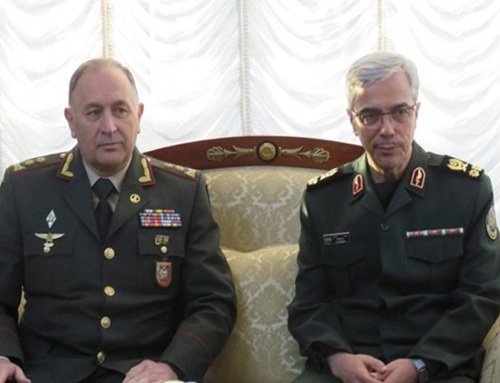 General Baqeri held meetings with other Azeri officials, including Prime Minister Novruz Mamedov on Thursday.